JQJ: What makes In The Heights so unique compared to other musicals you’ve done? DKP: Hip Hop. When I first did the show, the most exciting thing about it was the fact that there was hip hop in Musical Theatre. Lin Manuel-Miranda tips his hat to musical theatre with Nina’s character, where as Abuela and Vanessa are more salsa music, Benny brings R&B to the table and Usnavi represents the rap. I grew up listening to hip hop, as well as doing theatre, and back then no one thought hip hop was cool, and it was like I had to live two different lives. There’s a lot of awesome things going on with rap with the art of the rhyme and the verbal wit. That’s really what differentiates it for me in the way they took the old art form and applied it to the new musical style. It reminded me of why I love musical theatre, because it can take on every shape, and has the potential to be anything. JQJ: Were there any special challenges with the rapping and hip-hop style of the songs? DKP: I grew up with hip hop, so I was used to fitting words into the rhythms like that and figuring out the percussives of language. Learning rap wasn’t the challenge since I already had practice there. Even so, it definitely was nerve-wracking to rap on stage. It’s not like when you’re performing a rap song at karaoke and if you mess up the words, it’s whatever. In the theatre, if you mess up a word, you could lose part of the story, and it is definitely noticed by the audience. When I learned the lyrics for the first time, I drilled it as soon as I heard I’d be playing Usnavi because I had to know the lyrics like the back of my hand. 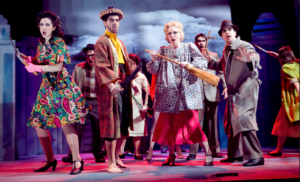 It’s not like classical ballad musical theatre, where the rhyme is not always as important. In hip hop we have to be clear in the specificity of a word, and pay attention to the word play and the sound play – it is that manipulation of the sound that is so interesting to me. JQJ: Community is really at the heart of In The Heights. I’m curious what community means to you and how it has shaped your life as a person and artist. DKP: For me, theatre really represents a community where we all come together, and whether it’s in rehearsal, or during a show, or in the lobby, you can’t ignore each other. We came to the theatre to have a personal experience. Growing up in a Latin community, I loved the parties when we all got together and everybody would celebrate. When we stuck together, we stood strong. The community is the strength, and there’s this universal consciousness uniting us. Community is family, and I feel you owe it all to your family. Not just in the sense of shared blood, but family can mean many different things for everybody, whether it’s your parents, or the people you grew up with in your neighborhood. I feel that everything we do is for our community, because to an extent we are a reflection of all those things that we’ve absorbed and all those things that we’ve been taught. JQJ: With all the recent buzz over Lin-Manuel Miranda’s Hamilton, do you think that energy has revitalized passion and interest in his first Broadway musical, In The Heights? DKP: Certainly. It’s definitely given new life to In The Heights. He changed the game with both plays, but something about the founding fathers got everybody involved. The contrast he created by doing hip hop music with that time period allowed him to connect the story of hip hop with the story of Alexander Hamilton. If you think about all of the initial people that came to the United States, everybody immigrated, and it’s that same story of rags to riches that overlaps with the hip hop narrative. The American history aspect of Hamilton also connected to a wider audience. Now, In The Heights reaches out to those new fans, and it’s still relevant due to the themes of community, gentrification, and racism/discrimination that still exists. It’s going to have a second life and a revolution of its own. JQJ: How has your experience with Aurora Theatre been thus far, and what impact do you think this play will/can have on the greater Atlanta region? DKP: The people there are doing it for the love of the art. It’s healthy and it’s artistic, as opposed to doing things simply to sell tickets. I could tell these people really believe in their community; Anthony and Ann Carol are dedicated to making a difference here and connecting with the community and really changing the way people around here view the world around them. They’re really using theatre for what it’s meant for: making a difference and having conversations. Not changing people per se, but bringing the discussion to the table and letting people sort it out themselves. Meeting them has inspired me to do what they do. I’m at awe, and everybody seems to be here for the same reason. As for how this play can affect the region, In The Heights will help us see those around us while teaching us to take them into consideration. It shows us how valuable everyone really is as a collective unit. There’s also something about the show that speaks to the individual, in regards to our aspirations, our dreams, and our struggle for a sense of contentment. That’s what I feel a lot of the characters in the play are going through. 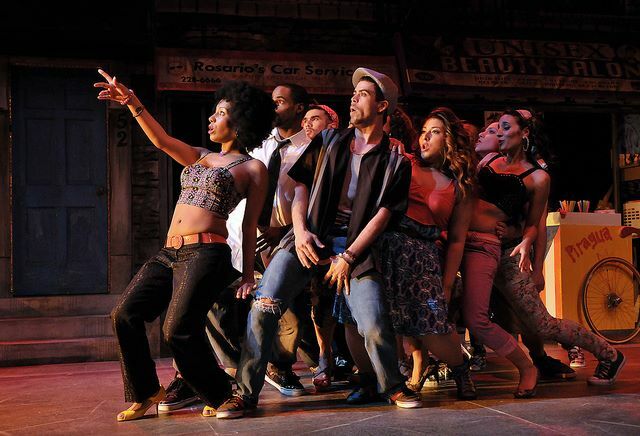 In The Heights reminds us that life is all about these connections that we’re making with each other, and being here now is what it’s all about.